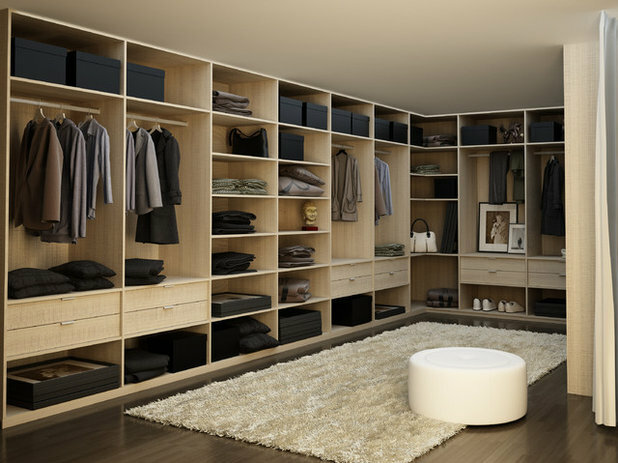 When it comes to designing a wardrobe there’s a lot to consider, from space planning and functionality to aesthetics and ergonomics. You’ll need to consider what lighting to choose; where to position the mirror; and whether your joinery comes with or without handles? 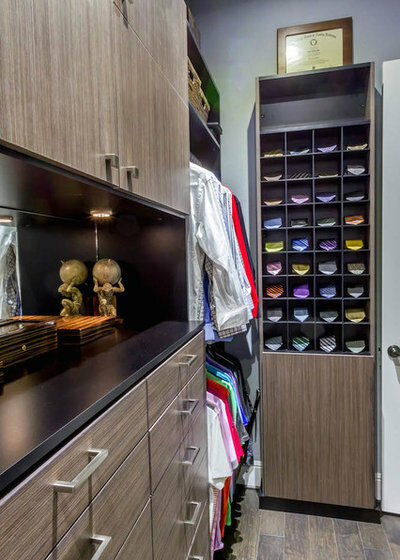 So, I asked two experts, Sally Hart of the Clever Closet Company and Anton Randall of In The Closet, who both know every nook and cranny of the wardrobe business. Here are 10 questions I put to them about the aesthetic and functional design of a wardrobe, followed by what they say you need to know. 1. Should I choose light or dark coloured joinery? 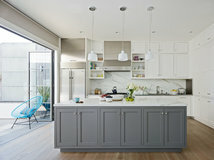 Choosing joinery is very much related to the style and colour palette of a home, and both Hart and Randall suggest clients choose a colour that they are more likely to feel comfortable with for a long while. “Joinery is a significant investment and generally clients want longevity from such an investment,” says Hart. 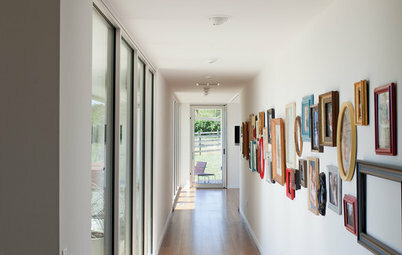 She suggests matching or relating joinery to that which is already used throughout the rest of the home. 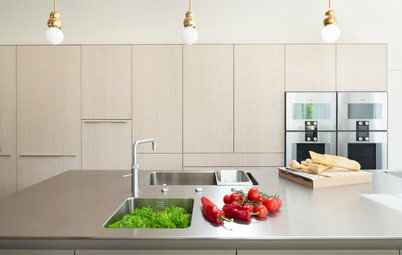 “Take a lead from the kitchen or keep to a classic style in the direction that the home will be renovated,” she says. 2. Should I go with a natural or synthetic material for joinery? The choice of joinery made from natural materials, such as timber, or a synthetic material, such as laminate, may in part be determined by what you can afford as well as the joinery in the rest of your house. 3. Is joinery better with or without handles? 4. 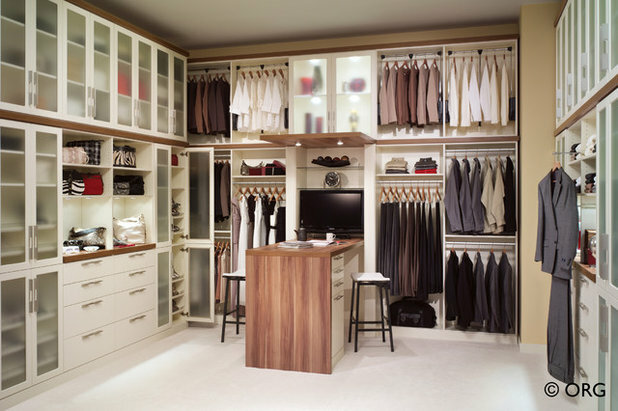 What type of lighting is best for both viewing and maintaining the condition of items in the wardrobe? 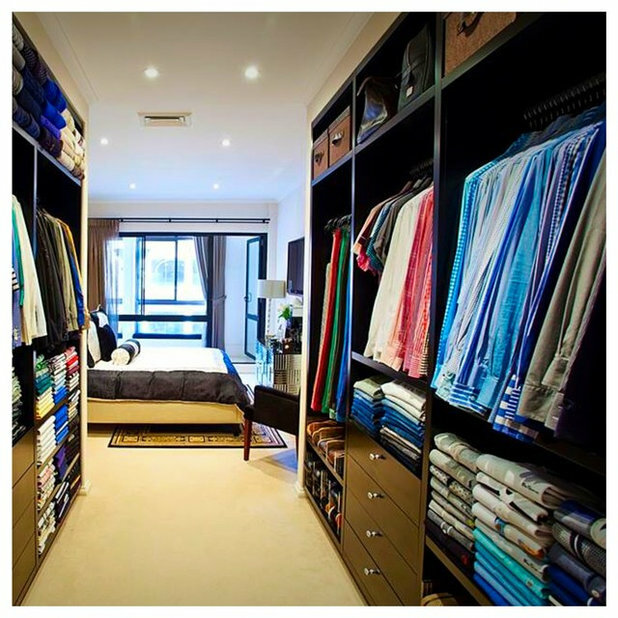 Randall suggests warm lighting is best for viewing clothes, “this way you get a true colour of the clothing, and it’s a lot softer on the eye.” It also helps with maintaining the longevity of clothes and other items. “If the light is too strong, it can damage the clothing over time with discolouring and sometimes even burn marks,” he says. 5. 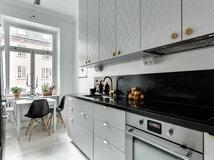 Where should lighting be placed? 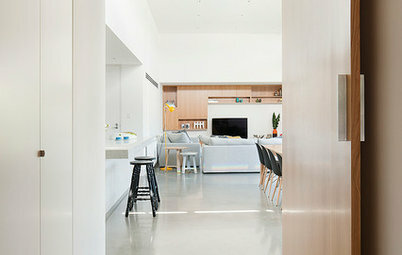 Lighting not only needs to be functional for accessing a wardrobe and viewing items but the placement of lights can help create a mood or feel in the space. 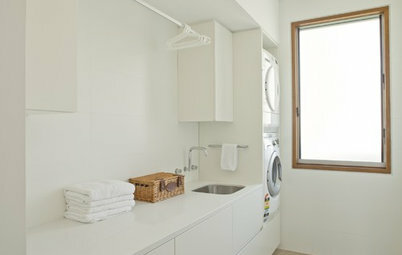 “Recessed lighting provides a lovely moody effect for walking through to ensuites,” says Hart. 6. Where should the mirror be positioned? 7. 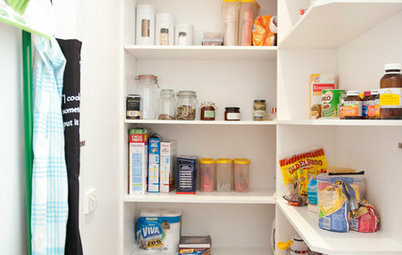 What are the pros and cons of wardrobe doors? While the choice of whether to have doors is often up to personal preference, it may also be dictated by budget, space and style. For Hart, “cabinet doors are a pro, if that’s the appearance you like. 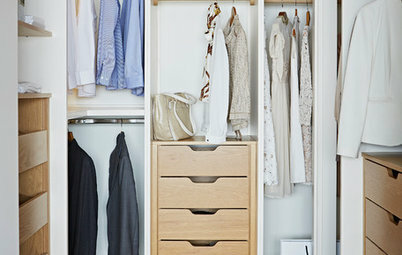 They’re convenient for clothes rarely worn, such as formal gear, to keep the dust off.” However, on the cons list, Hart says, “closet doors add to the overall cost by at least double and become annoying in a small area because they effectively become an obstacle.” She says that she’ll often install doors in just one section to get the benefits of both having them and not having them. 8. 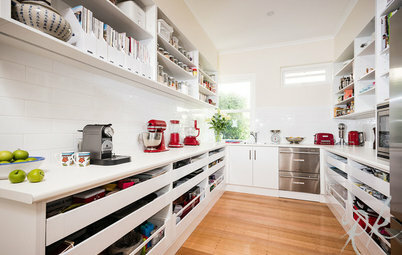 Is there a ratio of hanging space to drawers and shelving? 9. Is the temperature of the room important? 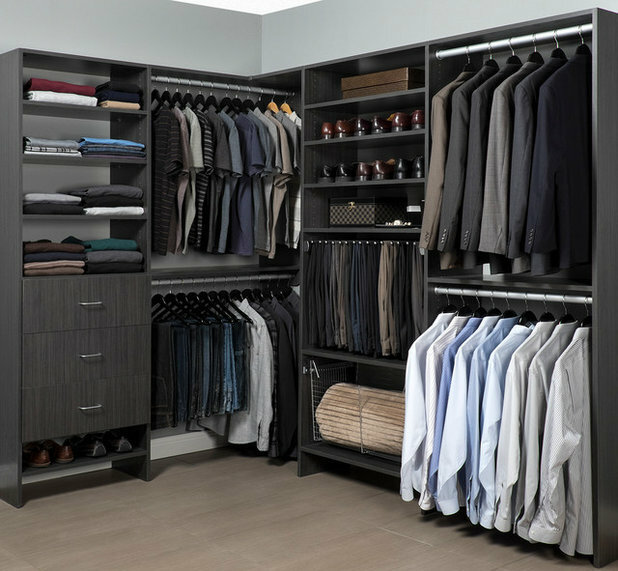 Temperature and ventilation can play an important role in keeping a wardrobe smelling fresh and fabrics in tip-top condition. If you have the luxury of a window or being able to control temperature in your wardrobe then factor this into your design. 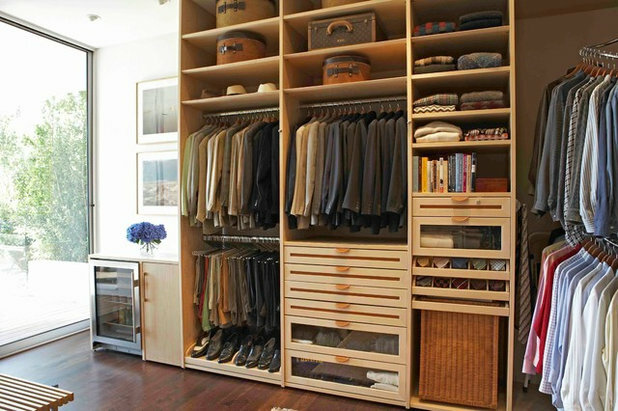 Do you have any tips for a well-designed wardrobe? Post them in the Comments below. Not a fan of open wardrobes. Love a dressing room with beautiful cabinetry, mirrors and seating. I have never seen a working wardrobe that looks like these staged photos in reality. 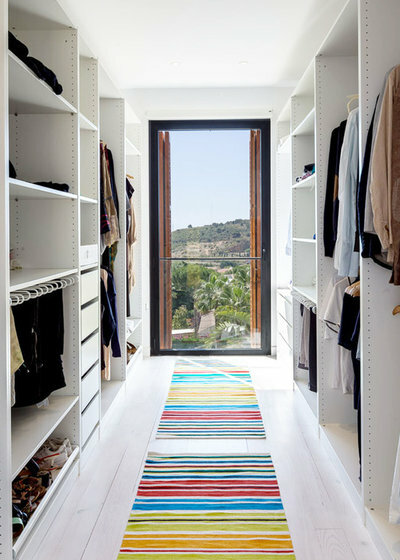 It is so much fun creating and styling wardrobe spaces, we have some great tips to bring life to existing wardrobes, closets...any storage apace really. 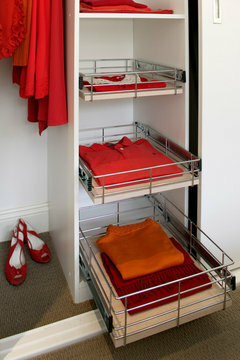 Stainless steel wire baskets are excellent for wardrobe storage because they keep good airflow around your clothes. 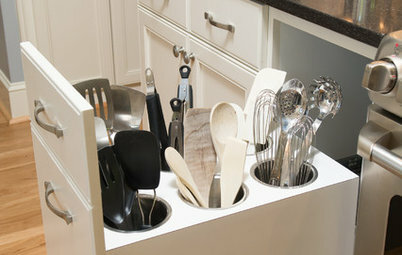 Much of the wardrobe baskets on the market are poor quality, so these are an excellent long term investment and far less expensive than drawers. Easy DIY install, so professional install not essential. Here is a link with more information.